If you’re idea of breakfast food involves frosted cocoa goobers and fruity nutter puffs, this recipe probably isn’t for you. This granola recipe is for people who want a healthy breakfast cereal that doesn’t cost $18 per 7 ounces. 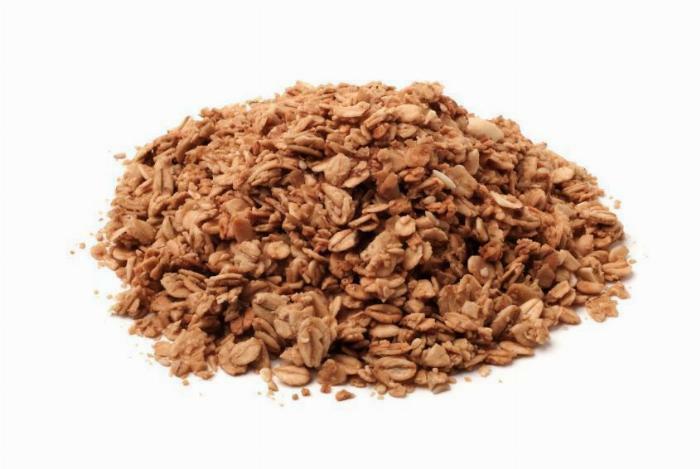 This is a simple rolled oats granola recipe, which accommodates any additions like raisins, almonds, berries, dried cranberries, or anything else you want to add. 1Preheat your oven to 325 degrees F.
2In a medium size saucepan, bring the water, syrup, brown sugar, and cinnamon to a boil, then simmer for 15 minutes. 3Stir the vanilla into the saucepan and remove from heat. 4Add the 8 cups of oats to a large mixing bowl. Pour the water and syrup mixture over the oats. Stir the oats to thoroughly coat all oats with the water and syrup. 5Evenly spread the oats over a large, non-stick baking sheet. Bake the oats for 10 minutes. 6Remove the oats from the oven and stir them on the baking sheet to turn over all oats, then bake for another 10 minutes. Let cool to room temperature, then store in an airtight bag or container. This granola will not be crispy when it comes out of the oven. The cooling process after baking is what makes the oats crispy. If you bake the oats too long, or with too much heat, you will burn or completely dry out the oatmeal.